Juraj Jakubisko started his career in film by studying still-life photography at ŠUP before continuing his film education at FAMU. One of three great Slovakian directors to come out of FAMU at this time, he blazed his own path by entering theater as a scriptwriter working at Laterna Magika. Different from the other two directors, Havetta and Hanák, Jakubisko began his career shooting experimental shorts before directing his first feature film KRISTOVE ROKY (THE CRUCIAL YEARS, 1967). Though similar to the other two directors, Jakubisko struggled under the Communist regime in Czechoslovakia. His next two films, ZBEHOVIA A PÚTNICI (DESERTERS AND NOMADS, 1968) and VTÁČKOVIA, SIROTY A BLÁZNI (BIRDS, ORPHANS, AND FOOLS 1969) would be banned outright and his fourth feature, DOVIDENIA V PEKLE, PRIATELIA (SEE YOU IN HELL, FRIENDS 1970/90), would be forced to end production and wouldn’t be completed until 1990. Jakubisko spent the next decade relegated to doing television and documentaries but returned to feature film with POSTAV DOM, ZASAĎ STROM. 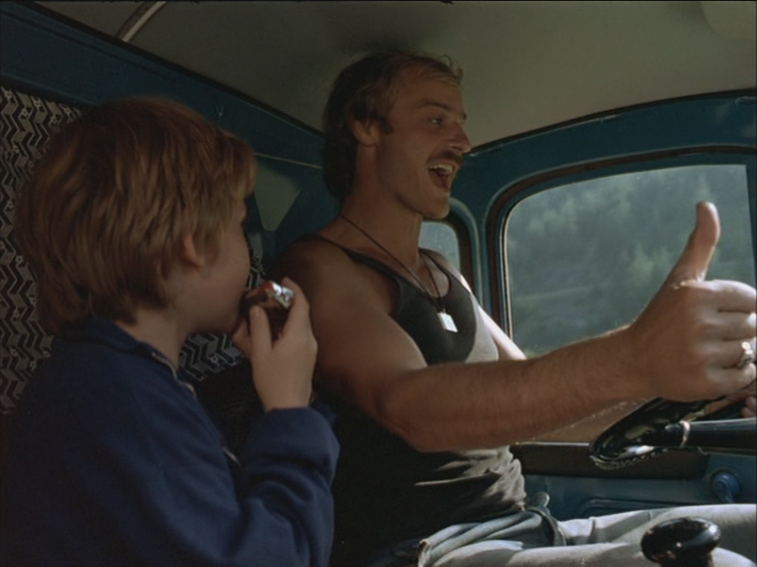 Jozef Matus (Pavel Nový) has hitchhiked to the end of the route of a beer delivery to a rural mining village, and is instantly involved in rescuing two children who have gotten lost in a pit. One of the children he rescues, Ivan, belongs to Helen (Jana Březinová), a divorcee and daughter of the chairman at the local mine. The family of the other child throws a party in honor of Jozef and the village quickly comes to like him for his actions. While at the party Jozef promises to build a house, plant a tree, find a wife and have a son and quickly sets out on this path. Jozef stays with his friend Ziga (Ondřej Pavelka), whom he meets the first day in town. Determined to complete what he promises, he visits Helen’s father for a job driving trucks at the mine. Soon Jozef begins to change as we see the risks he is willing to take to complete his goals. While trying to achieve the affections of Helen, he takes her and her son tp a small brook and promises her a two-story house in that very spot. When it isn’t coming along fast enough, Jozef resorts to cheating and stealing to get the tools he needs for the house. Eventually Jozef drives away his friend, Ziga, pushing his moral limits, but Jozef quickly finds an immoral replacement at the mine who is willing to steal with him. Though Helen falls in love with Jozef, she starts to question how Jozef is acquiring everything and accuses him of stealing. Helen’s father, who distrusts Jozef, uses this opportunity to pressure Jozef’s cohort into snitching on him. Jozef tries to load up all the stolen equipment in his truck and dump it, but is chased by the police. 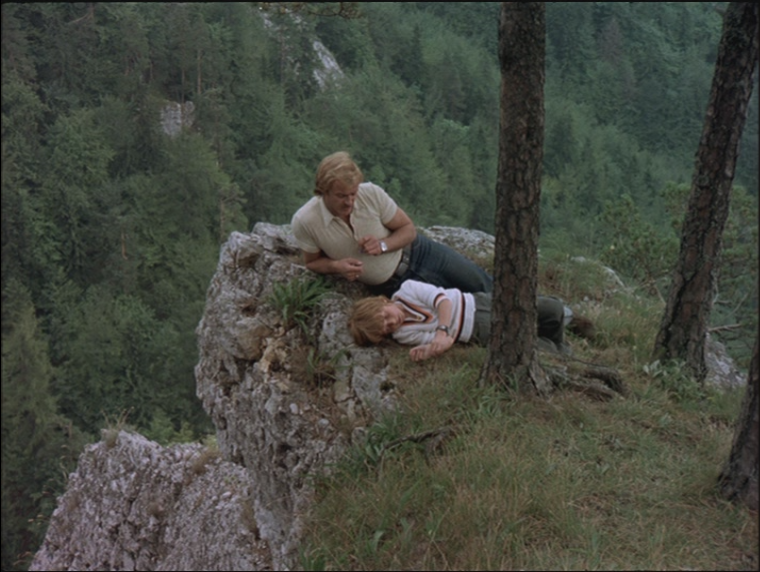 While trying to unload the equipment, he accidently backs up off the cliff and dies in the wreck – this is POSTAV DOM, ZASAĎ STROM’s opening scene. 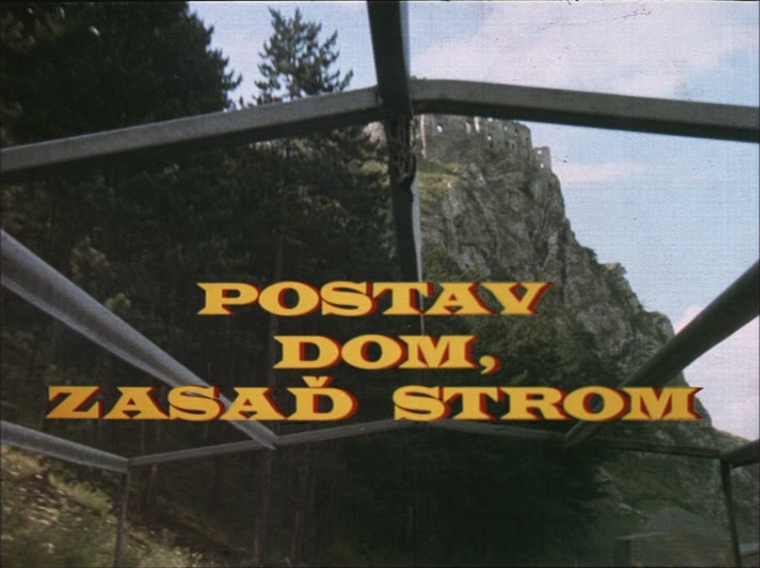 POSTAV DOM, ZASAĎ STROM is a wildly different style from where Jakubisko left off a decade prior. His first feature films are limited in narrative and have outrageous characters that inhabit a world of magical realism whose actions and dialogue are complex allegories for the political and moral situation in Slovakia. POSTAV DOM, ZASAĎ STROM is much more grounded than these previous films, but still has a touch of Jakubisko’s original style. Jozef is steeped in mysticism, a character with seemingly no past and no connections, who is haunted by dreams of his death and who keeps lucky charms. He has several scenes where he tries to predict the luck of the people closest to him, Helen, Ivan, and Ziga. He also attempts to instill his philosophy on Ivan, who over time begins to dress and act like Jozef. This is also an extension of Jozef taking Ivan as a son, as we begin to recognize that Jozef takes everything that he wants. 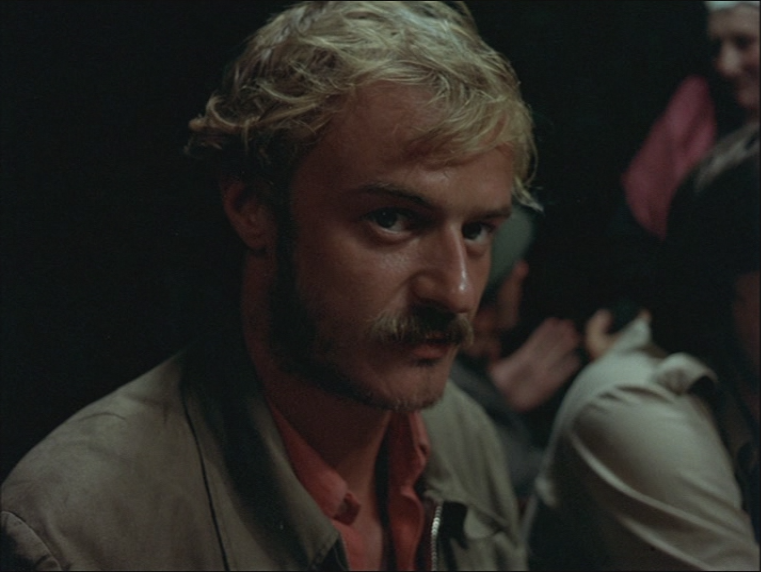 Jakubisko deceives the audience through establishing Jozef as the main character and the villages’ instant trust in him, though he never attempts to hide Jozef’s motives. In the opening scene, we watch as Jozef meets Ziga and demands a cigarette from him; the camera cuts to Jozef’s face in a charming glance and then a cut back to Ziga who seems enchanted. This marks an enchantment that not only settles on the village but also on the audience. Ziga appears to be the only character that is entirely portrayed in Jakubisko’s original style. Maintaining a steady goofy persona, Ziga is also trusting of Jozef and becomes a vehicle for the audience’s understanding of the illusion of Jozef. The character of Ziga feels like he could be another part of the trio in VTÁČKOVIA, SIROTY A BLÁZNI, a fool unaware of his surroundings. Jozef is the contrast to Ziga, as Jozef is aware of how society works and manipulates it to his advantage, a useful skill in the Communist era. He understands how to assert this authority and does so upon all the other characters, and passes the knowledge on to his surrogate son, Ivan. Still Jozef is unaware of his weakness, his fear of fate, an element that he cannot overcome. This increased focus on a central character’s masculinity also leads to a stylization previously unseen in Jakubisko’s films. A love scene between Jozef and Helen, along with a scene of a truck crashing, seem ostentatious is ostentatious and represent a break in Jakubisko’s usual functional style. Jakubisko clearly grew in the decade he spent away from feature films. While some viewers may prefer his more stylized Czech New Wave films, POSTAV DOM, ZASAĎ STROM shows a more mature sense of craft in which he is more subtly able to allude to his social and political commentary that is hidden within POSTAV DOM, ZASAĎ STROM. Jakubisko is successful in having the audience question what system Jozef is a product of and if he is morally correct. 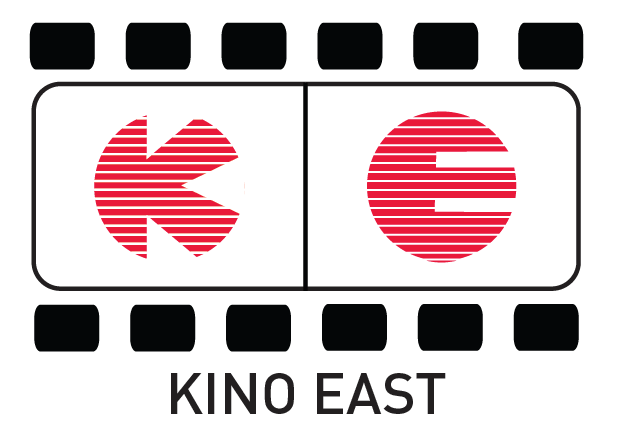 POSTAV DOM, ZASAĎ STROM is available as a region free, PAL, DVD from SME.